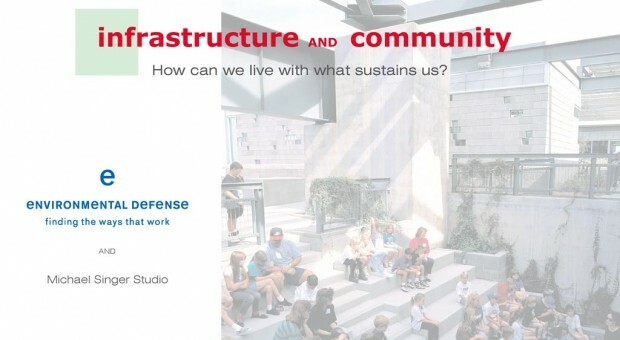 Infrastructure and Community is the result of an ongoing collaboration between Michael Singer Studio and the Environmental Defense Fund’s Living Cities Program. This infrastructure white paper was distributed as a planning tool for policy makers, community groups, planners, and infrastructure developers across the United States and to select groups internationally. The report uses three infrastructure case study projects by Michael Singer Studio and examines each project in-depth in terms of five main topics: site context (environment), energy, public access, water and architectural design. The purpose of Infrastructure and Community is to put forward concepts and ideas that can integrate infrastructure with its surrounding community. The paper focuses on infrastructure in a large urban context where space constraints are most visible. Many of these strategies are also applicable to smaller municipalities, and are interchangeable with any service infrastructure that is difficult to site. The goal is to provide elected officials, city planners, policy makers, engineering consultants and community leaders a document that will encourage creative thinking, spark ideas that are outside of typical considerations, and result in new approaches in siting and design of infrastructure facilities.